"After that trail, if there's one game I'll never play again it's Frogger," said an American rider, between laboured breaths. He was in the middle of a multinational chain of BC Bike Racers that included a Chilean, Frenchman, Guatemalan and a Canadian. Forty kilometers into a 62-km day, climbs like the Sechelt classic Frogger can feel like salt on an open wound. That's when camaraderie is forged on the trail though - the unspoken language of mutual, dig-deep suffering. But there is always a reward. At the top of this ascent lies, well, another ascent, but eventually there's the loamy deliciousness of the stage's feature trail, VFR. This international cast of riders were deep in the pocket. You won't recognize their names. They're not sponsored, their faces don't appear in bike magazines, and battling for a podium position isn't even on the radar. Pre-race registration in North Vancouver now seems like a distant memory as riders try to sort out and catalogue the path behind them. Maple Syrup, Vanilla, Cream Soda - the list goes on like a sumptuous menu of singletrack cocktails. They're here because they've heard tales of epic BC singletrack and the legend of the BC Bike Race. It's day 4 - the Queen stage, an off road odyssey between Earl's Cove and Sechelt on BC's stunning Sunshine Coast. With nearly 1800m of ascending on the day's menu and after more than 130km of trail already covered in three days, leg muscles will be barking. The day began with a potpourri of transportation modes - yellow buses, Harbour Air seaplanes, water taxis and the BC Ferries, all used to shuttle racers from Powell River to the start of stage 4 at Earl's Cove BC Ferries terminal. Then it was time to switch to two wheel mode. There was excitement yesterday at the front of the race when Bulls athlete Karl Platt stole the top spot on the podium from Kabush. As pros lined up at the start line, a sustained and punishing gravel road climb awaited. Elite athletes like Kabush, Platt and Nash train hard for events like BC Bike Race. For people like Rolly Molina, the Filipino-born Canadian who told us back at the North Vancouver registration that he quit smoking six months ago, BCBR will be the biggest - and most rewarding - physical challenge they've faced. Molina decided to bite off BCBR, one of the world's ultimate singletrack stage races as his first ever mountain biking event. Half way through the week past injuries nag. The lower back begins to ache, feet are blistered, palms begin to grow calluses thick as alligator skin and arms and legs show scars from the trail. Molina is loving it - "Every day I do my personal best," he said at Aid 1. But an old bone spur has been acting up, and he's been making regular visits to BCBR's medical staff. "We manage a lot of blisters, small abrasions and cuts; we go through a lot of physiotherapy tape," said Colin Wilson, a Comox Valley chiropractor, who has been an integral member of the BCBR medical team since the event's inception. It takes a monumental effort to keep BC Bike Racers safe, healthy, well nourished and rolling down the trail day after day for seven days. From the Bike Patrol, hitting the trail early to ensure the trail is clear of debris, flagging makes sense and junctions well marked; the Shimano crew putting in long days to repair bikes en route, improvising when they have to; to food services; many pieces need to fall into place. It's like a traveling circus of orchestrated chaos that keeps solid core crew returning year after year. "It's basically a 12 month process to plan 14,000 meals over seven days," says catering manager and owner of Whistler Cooks Grant Cousar, a seven year veteran of the BCBR team. "We're always looking for ways to give riders that extra bit of emotional and mental nourishment." Preparation can go a long way for newcomers to the kind of raw, rooty, and technical singletrack that we love in BC. Juliet Plumb, a resident of Tasmania, raced BCBR in 2016 and had her eyes opened to the West Coast's singletrack riches but also the need to tweak her skills. "I realized my technical abilities were crap," Plumb said. Back this year, she arrived early and took a few half-day tune up sessions with Endless Biking on the North Shore. "It was awesome. I learned about body position, braking, vision and choosing the right lines," Plum said. It's paying off big time. Plumb is killing it in the over 50 women's category, so far claiming first place on all four stages. She looked strong crossing the finish line today, as did Kabush after he pushed past Platt on the final descent into Sechelt on some of the region's spiciest singletrack, VFR, while Kona rider Kerry Warner ascended to the podium in third place. 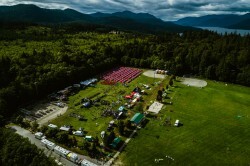 Tomorrow, BC Bike Racers remain in the hallowed hills of the Sunshine Coast for one final day, with ribbons of singletrack like Highway 101, a 7km singletrack descent all the way to the finish line.